My next donkey godmother is Carol Limmer. She saw me on a donkey forum (yes, there is such a thing), and immediately offered all the help she could. 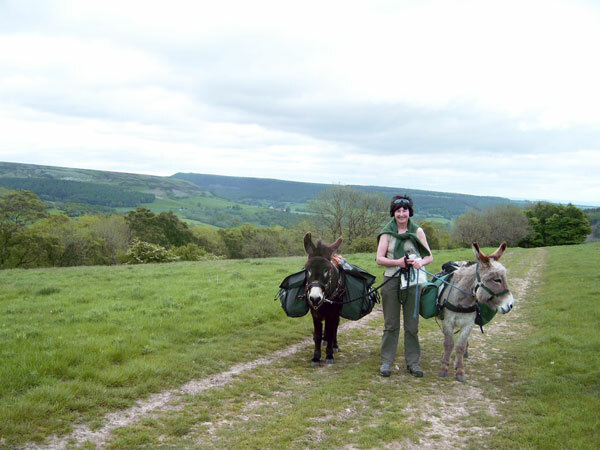 She walks with her donkey Echo, and is the only person I’ve spoken to so far who really does so in the UK. 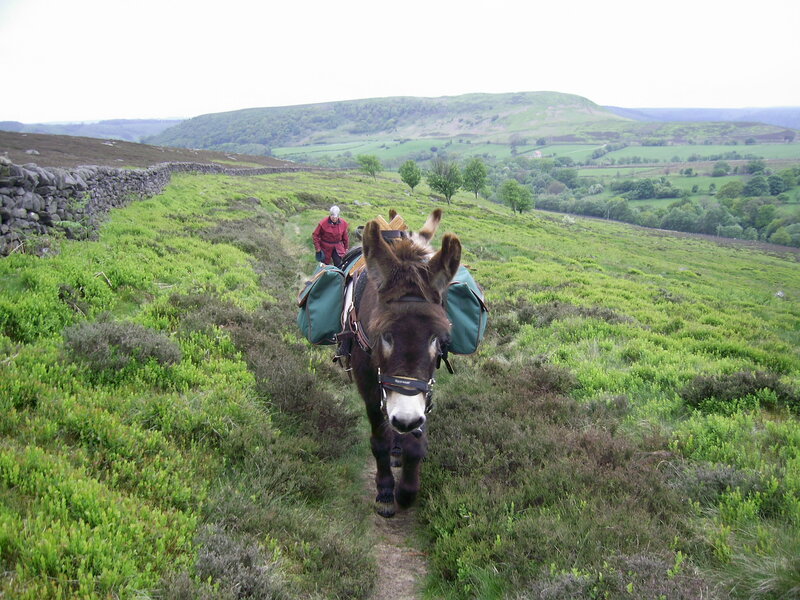 Echo and Carol, along with their friends Olwen and her donkey go on long weekends, identifying a B&B with stabling (from the British Horse Society book, Horses Welcome), and drive the donkeys to within a nice day’s walk of the place. Then they walk to it, with both donkeys laden. Day two and three they do round walks from the B&B, leaving their night luggage there so that one of the donkeys is unladen each day, and then on day four they head back to the horsebox. I got to meet Carol at the Manchester Donkey Sanctuary centre when she was giving a talk on donkey trekking. There were a dozen vaguely interested people there, and me – taking notes, video, photos, measurements etc about everything, eating biscuits, borrowing kit and trying to inhale their experience. Carol has also helped me on several occasions when I’ve called up in a panic wondering whether the perfectly happy-looking donkey was committing grass-gluttony suicide before my eyes, and whether it was a bad sign that he had charged through the electric fence. She weighed and measured her pack saddle for me, and sent me test results after her donkey kindly wore it up and down steeps in a quarry, and tried to buck it off. With uncanny timing she advised me just to let go of the rope when necessary, just before stalliongeddon happened. She also found and recommended the leather donkey sandals that I now have a pair of. Hopefully she and Olwen and their donkey entourage will come and walk a few days in north Wales. horse shoe nail, sharp end stuck in a cork – for digging out the stones that you can’t get with the hoofpick. Once got stabbed in the thigh with a horseshoe nail in my trouser pocket!! DONKEY’S PASSPORT – you are legally required to carry it. I’ve never been asked to show it.